Control your FireTV (Including Cube, Stick & Pendant w/USB “Y” Cable) and other Streamers lacking an IR receiver with the Inteset INT422-3 universal remote or Harmony remotes. Blue LED flashes when a signal is received. LED can be turned on/off on Fire TV & Nvidia Shield. Cable is 3 feet long. 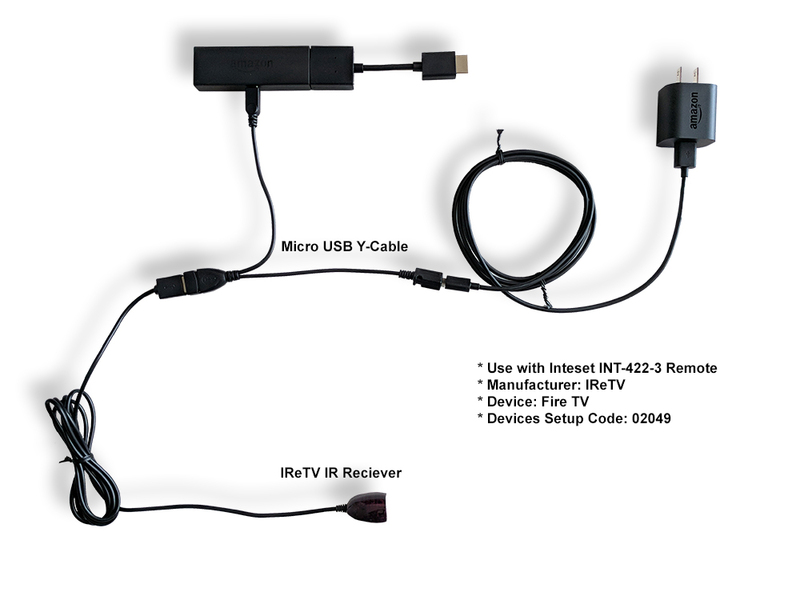 The IReTV USB IR Receiver is designed and built to work with FireTV (Including the Cube, Stick & Pendant w/USB “Y” Cable), Nvidia Shield-2nd Generation consoles (1st Gen and Pro versions do not require an add-on IR receiver), Media Center and MCE related apps as well as Kodi on a PC and Kodi on Raspberry Pi. This IR Receiver works only with Inteset INT422-3 and Harmony remotes (Remote NOT included). Some older INT422-3 remotes will need to be updated to control Fire TV. Contact us to update your remote free of charge. To install the IReTV IR Receiver just plug the USB connector into the port on the device you want to control and enter the Device Code for that device in one of the available Device Code buttons (A, B, C, D) at the top of the remote. You can then use the other device buttons for your TV, Cable box etc. We have provided a Key Map for these devices above or you can view the map in the link below. The Device Codes are: 02049 (FireTV), 01272 (Media Center), 02000 & 01272 (Kodi on a PC & Kodi on Raspberry Pi) and 04918 (Nvidia Shield).